It took my friend Richard to tell me this. He’s French by origin, and so is Frédéric Tandy, the chef of Ratinaud, a gourmet charcuterie in Halifax. Good buddies in a culinary sort of way. So here is Richard chez Fred, showing the world how to eat these fabulous sea urchins from Digby. I haven’t ever tried them – have you? 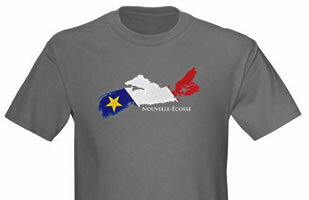 Got French Acadian roots? Lots of people do. A few years after taking over mainland Nova Scotia from the French and founding Halifax in 1749, the British drove the Acadian settlers from the soil they had tilled for generations. Some years later, many Acadians came back to Nova Scotia and lived quietly in remote communities, not calling much attention to themselves, making waves only at sea in their fishing boats. Over time, many of their descendants assimilated into the larger English-speaking culture. In the last number of years, however, Acadian culture and language have been waking up. A province-wide French Acadian school board runs 21 Francophone schools throughout the province, and a network of organizations and community centres ensure that Acadian arts and culture enrich the fabric of Nova Scotia. *Items are printed on demand in the USA by CafePress. In my experience, items printed on paper, fridge magnets and posters have come through the mail without duty. However, any clothing not made in the USA (i.e. most of it), mugs and certain other items require duty (18%, I think) as well as GST/HST to be paid at the post office. Your experience may vary. Clothing made in the USA is clearly marked as such in the shop. This has got to be one of the coolest webcam locations in the world. It’s in Halls Harbour, where you can see the fishing boats go up and down with the world’s highest tides on the Bay of Fundy. Here’s how it looked today, Sunday March 14, at high tide. Go to www.novascotiawebcams.ca/hallsharbour/ (will open in new window or tab on your browser) and compare what you see with this. Halls Harbour this morning at high tide. Some days the tide is even higher. 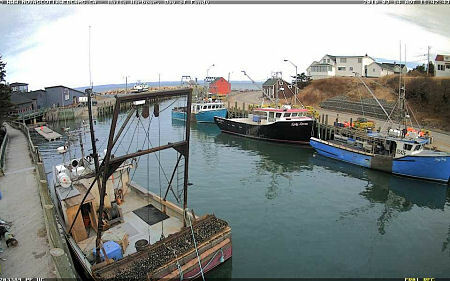 Click the picture to go to the webcam and see what Halls Harbour looks like right now. Here’s a link that will give you the current tide times for Halls Harbour (actually for nearby Baxters Harbour, but close enough). Since we live and sail on Mahone Bay and have come to know most of its islands by sight, I read Frank Parker Day’s 1928 novel Rockbound with great interest. I wasn’t the only one. Thanks to CBC’s Canada Reads program, the previously obscure novel has been lionized by the Canadian literary establishment and the public. One of the book’s biggest fans is my mother. She has read it several times. When I took her sailing around East Ironbound Island, the setting for the novel, the binoculars and cameras were in constant use. If Day’s characters were as thinly disguised as his settings, it’s no wonder that the locals he met on Ironbound felt betrayed by his portrayal of hard-drinking, feuding fishing families eking out a hardscrabble living on a small island. But they are long gone now, and new generations of readers marvel at the dramatic sweep of his story, his vivid characterizations and the detailed portrayal of pre-industrial fishing. For me, Rockbound has made the outer islands of Mahone Bay come alive with the ghosts of those who have gone before. 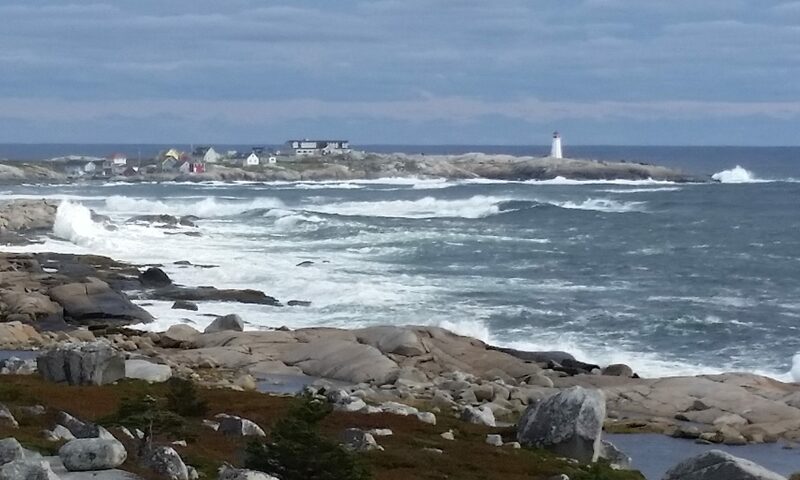 Imagine rowing from Tancook to Ironbound, from Ironbound to Pearl (“Barren Island” in the novel) – well, I can’t, really, but characters that I have come to care for do just that in the novel, so I believe it is possible. Poster for Rockbound, the musical. Click picture to visit Two Planks website. When I heard that Two Planks and a Passion Theatre Company was developing Rockbound as a musical, I was astonished and very curious. Written by Allen Cole and under development since 2006, it is now playing “off the grid” (outdoors) at the Ross Creek Centre for the Arts, half an hour north of Wolfville. My mother and I, both very excited, went last Wednesday. From the opening song, my questions and doubts about how a musical format would serve the story were laid to rest. My ears were awash in delicious sound and my jaw remained in my lap for much of the performance. Harmonically and rhythmically complex and expressive, the music transcends genres and beautifully evokes the epic story and the setting. The acting and singing were wonderful. How else could this play have been done? The music elevates the story, poeticizes it, universalizes it. I hope to see Rockbound again when it comes to Chester Playhouse August 13-16. Meanwhile it is playing until August 9 at Ross Creek. Not to be missed.